Western blotting technique or protein immunoblot is used for detection and quantification of specific protein molecules in the given complex protein sample. A protein molecule is separated on the basis of molecular weight and size, forming bands on the gel which is further transferred onto the transfer membrane for visualization and analysis of the western blot. Western blotting market contributes a major share in the molecular diagnostics market in terms of revenue. Molecular diagnostics include various analytical techniques used in the field of proteomics and genomics. Rising prevalence of HIV and increasing spending by pharmaceutical companies on R&D activities are expected to be the key growth drivers during the period of study. Geographically, North America dominated the western blotting market driven by increasing prevalence of HIV and Lyme disease, U.S.- China collaborative program for biomedical research, rise in research funding and increasing production of genetically modified crops, and rising number of conferences. 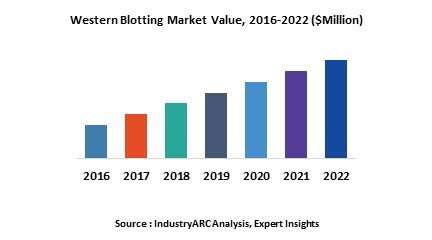 North America was followed by Europe and Asia-Pacific as second and third largest market for western blotting market. Asia Pacific is projected to have the fastest growth due to increasing government interest in the biomedical & biotechnology industry in China, presence of bioclusters in China and India, government initiatives supported by funding in Japan, and growing pharmaceutical industry in India. This report identifies the western blotting market size for the years 2014-2016, and forecast of the same till the year 2022. It also highlights the market drivers, restraints, growth indicators, challenges, and other key aspects with respect to the western blotting market. 15.4. Thermo Fisher Scientific, Inc.
15.10. F. Hoffmann-La Roche Ltd.